Month One is over and I just finished my shirt in the nick of time. I was stuck on how to finish it. I decided that the frayed bottom did not look very good with the linen I chose. The linen was too formal for frayed edges. With that decision made, I hemmed the bottom and left off the frayed sleeves. 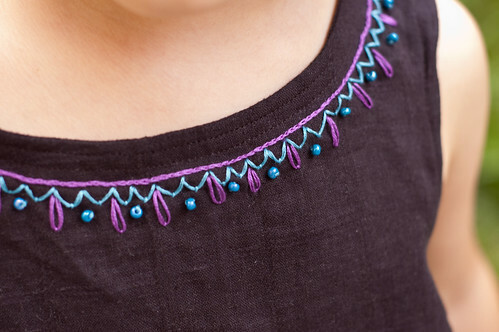 I didn't have a doily on hand so I embroidered a collar around the neckline. This pattern was a breeze to sew. If I used store bought bias binding I could whip one of these out in under an hour! I wish I had a chance to do the pants for this month's optional pattern, but they will have to wait a bit. I will have the next pattern ready to announce tomorrow along with this month's winner! 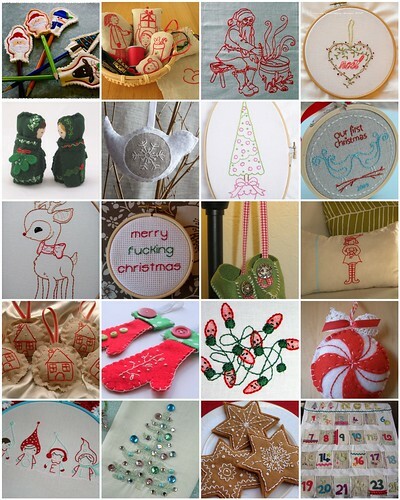 I also came across a couple more Christmas embroidery designs on flickr. Hope I gave you some last minute ideas! Have a great week! 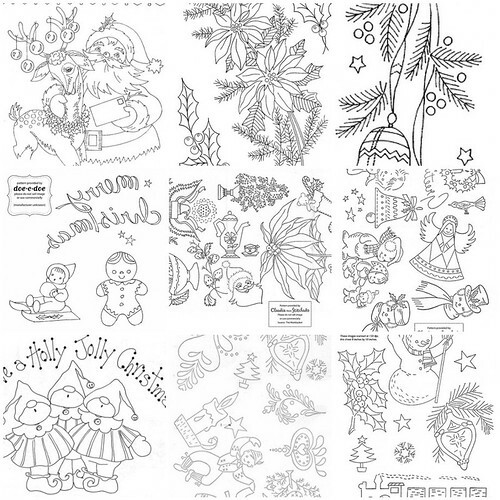 There are so many holiday patterns on the internet that I had to break this series into parts. Look for more pattern links over the next week. Its time for turkey! I love Thanksgiving. My husband, being part Native American, has a love hate relationship with it. He says that as long as we are celebrating the season, the harvest and all the prosperity we have had the past year then its okay. If you start getting into Indians saving Pilgrims and long dinner tables full of food in 1621 then he starts getting sick to his stomach. Check out the history of Thanksgiving for more about the origins of this holiday. I love Thanksgiving food and the chance to catch up with friends and family. Tom and I try to focus on what we have gained over the last year. What was our "harvest"? Every year we have goals for ourselves and for our family. At Thanksgiving we celebrate how far we have come to reaching our goals and we start planning for next year. So enough about me, onto the patterns! I went on a long search for Turkey Day patterns and here is what I have. If you know of a pattern that isn't listed please leave it in the comments so I can add it to the list. 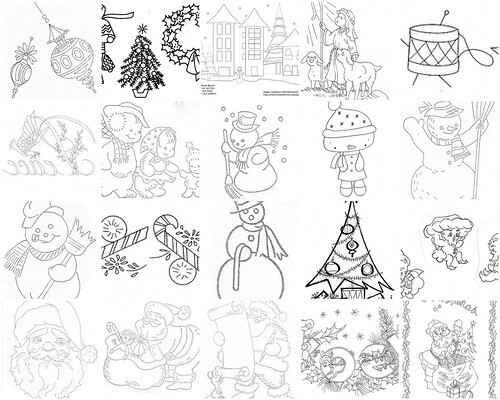 -Thanksgiving Turkeys and Word "Thanksgiving"
-Google Thanksgiving Coloring Pages Search - Its awesome! 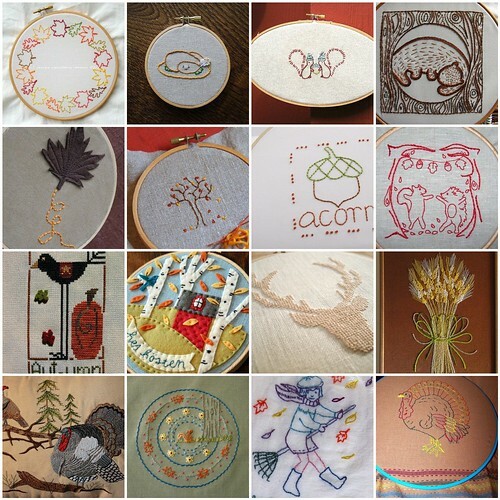 I found very few completed embroideries for Thanksgiving. 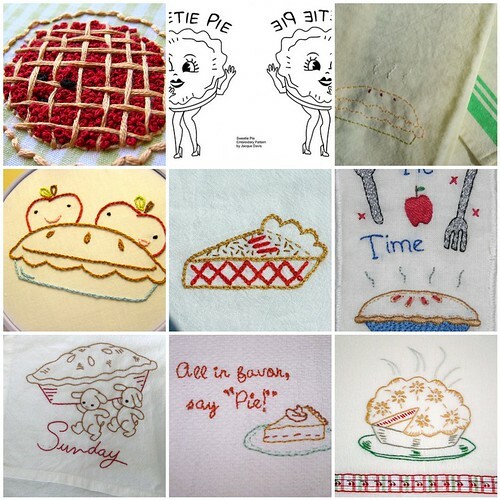 I am working on a pattern list of Thanksgiving embroidery patterns from around the net so look out for that in the next couple days. Hopefully we will see some more turkeys in the days to come. Halloween was lots of fun. My little one dressed up as a ballerina. She didn't want to get a tutu so we used her ballet costume and she picked out stockings, a crown, and a star wand. She dug the black ribbon around her waist out of my ribbon drawer for her "sash". Her leggings are the sleeves of a felted wool sweater that still had a little stretch to it. I just cut the arms off and put them on her legs! Easy as that. They fit perfectly. She picked out the color. I tried for pink but lost. 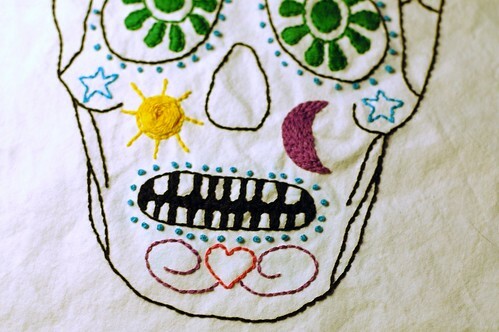 Onto crafty things... 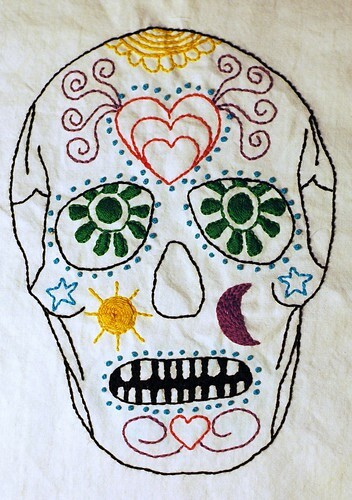 I finished another embroidery. This one is eventually going to be framed in a 6 inch wooden hoop. Jo-Anns is 45 minutes away so its going to have to wait until I go to town again. The Owl Embroidery is in the same boat. I need a certain color thread to finish it. 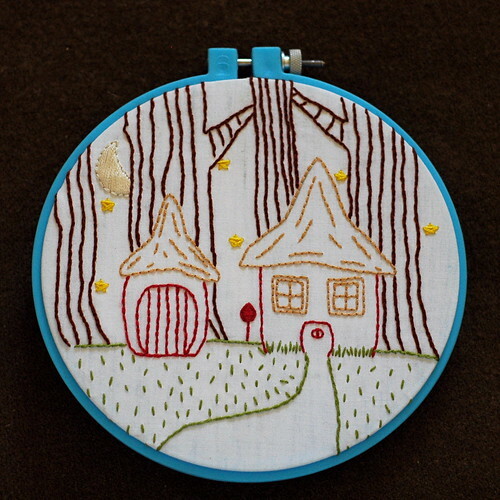 The house and workshop were done in backstitch. 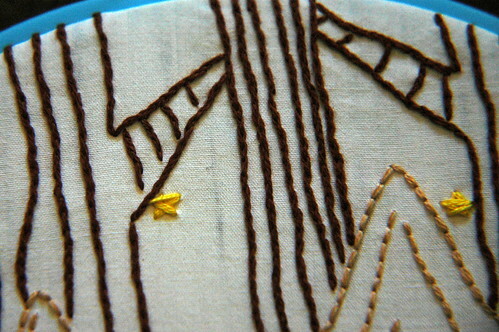 The trees were done in split stitch. Seed stitch for the grass. 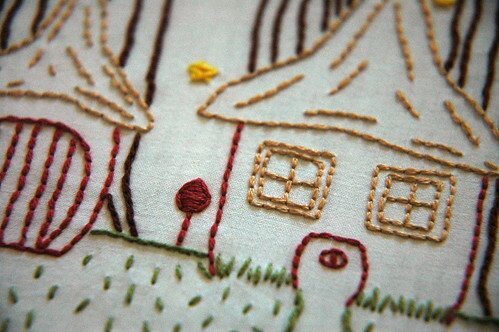 The moon and mailbox are in satin stitch. I am working on a pattern for a Thanksgiving embroidery based on a vintage Thanksgiving postcard. 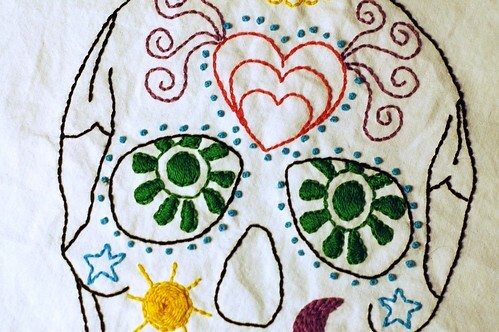 I am about done with the pattern and I cant wait to start stitching it. Hope you had lots of treats and few tricks this Halloween! Got it finished! 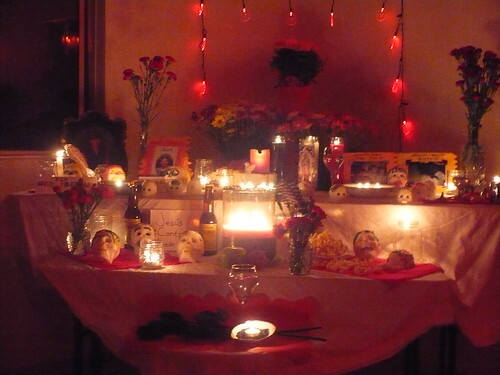 I wish the pictures were a little better, but I didn't take them until this evening and the light was terrible. I had to use a lamp to get enough light. I love how his eyes turned out. I figured out the teeth as soon as I finished the outline of the mouth. It was an "duh, of course" moment. Tom didnt like how I had the nose on the original pattern and I have to agree after stitching it. I am making a couple of changes to the pattern. It will be posted on flickr in the next day or so. 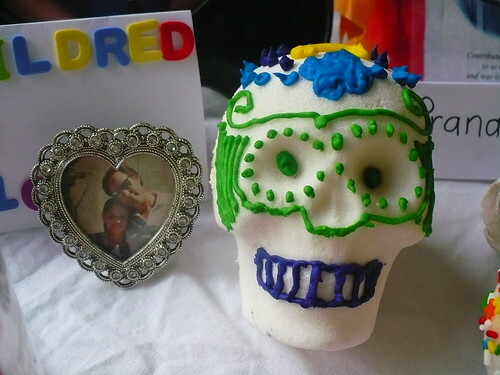 I chose the same bright colors that you would see on a real sugar skull. 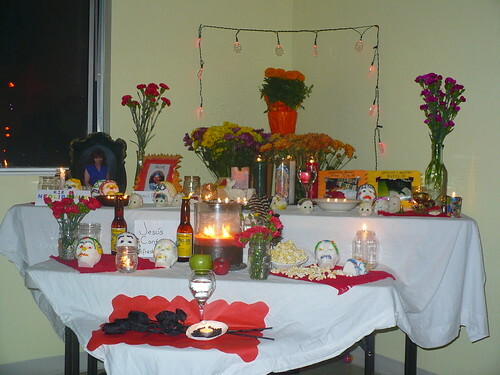 I had the opportunity of decorating a great Day of the Dead altar last year with some friends so I had lots of inspiration. Isn't that the coolest bread! Those are supposed to be bones crossed on the top. 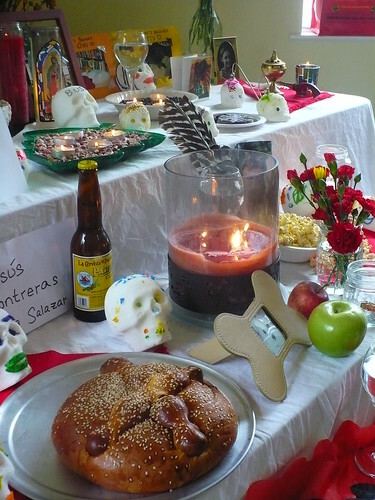 Its a Mexican bread traditional on Dia de los Muertos. The photo is me in 8th grade with my dad who passed away in 2005.